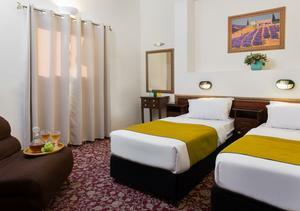 Welcome to THE GALILEO HOTEL TEL-AVIV, The most exciting, location oriented, budget place in town. Located at 8 Hillel HaZaken St, Only 5 Minute walk from Tel-Aviv's beach, surrounding with the newest edged clubs and hip nightlife, this location is best to sense the true vibe of the City That Never Sleeps. If you are looking to find some of the hidden gems that Tel Aviv has to offer you'll find everything is a short walk away: The colorful Carmel Market, the Pedestrian zone of NaChalat Binyamin or the renewed Sheinkin St. with its boutique shops. You can also use the vast public transportation options available nearby. Each of our rooms features Comfortable bed, , Free WiFi, A/C, Cable TV, Coffee / Tea, Mini-fridge and a Safe. 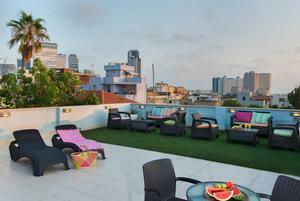 You can also relax in our sunny Rooftop. Our reception is manned 24/7 and our staff will assist you with anything. This is a small, comfortable, real value for money hotel with the charm and intimacy of a guesthouse, we look forward to welcome you here at THE GALILEO HOTEL TEL-AVIV. Each of our rooms features Comfortable bed, , Free WiFi, A/C, Cable TV, Coffee / Tea, Mini-fridge and a Safe. 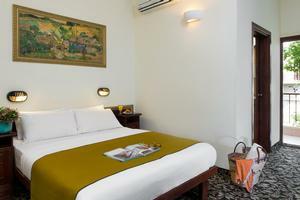 Welcome to THE GALILEO HOTEL TEL-AVIV, The most exciting, location oriented, budget place in town. Located at 8 Hillel HaZaken St, Only 5 Minute walk from Tel-Aviv's beach, surrounding with the newest edged clubs and hip nightlife, this location is best to sense the true vibe of the City That Never Sleeps. If you are looking to find some of the hidden gems that Tel Aviv has to offer you'll find everything is a short walk away: The colorful Carmel Market, the Pedestrian zone of NaChalat Binyamin or the renewed Sheinkin St. with its boutique shops. "Hotel clerks were friendly. It had much character. ..."